India’s decision to offer visa-on-arrival to citizens of 180 countries will be a boom for the medical tourism industry in the country, Ajay Bisaria, Joint Secretary of the Eurasia Division of the Indian External Affairs Ministry said at the sidelines of the Eurasian Health Summit 2014 in New Delhi. Russians would be among the major beneficiaries. “We’d like to share the 60 years of our development experience (in medicine) with our friends in Eurasia, including Russia,” Bisaria said. 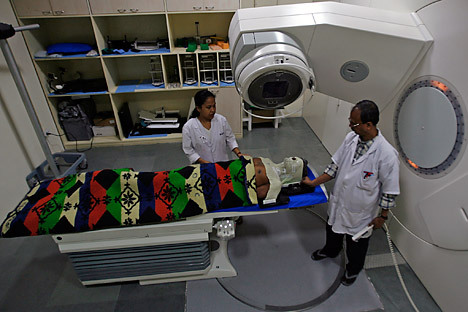 “Medical tourism, which we aim to promote in India, will also allow us to develop medical diplomacy.” He pointed out that India looks to develop cooperation with private and state medical organisations in Eurasia, including Russia, which he named said was India’s “important strategic partner.” This also involved the setting up of branches of big Indian clinics abroad. The health summit, which was organised by Medanta, a super-speciality hospital in Gurgaon, was attended by senior diplomats in the Indian capital, including Russian Ambassador to India Alexander Kadakin. “I’ve lived 25 years in India and I remember that in 1971 there was just one decent clinic in Delhi which offered European service – the Holy Family hospital,” Kadakin said while praising the Medanta hospital. “I can say that India has gone a long way since 1971,” he added. Renowned cardiovascular surgeon Naresh Trehan, who is also the managing director of Medanta, said that his hospital was equipped to deal with Russian patients. “We have interpreters from Russia, we have the food that Russians like and we can make them comfortable in our clinic,” Trehan said, adding that the hospital would have a Russian-language website. Trehan said about 16 percent of the 61,000-odd international patients that the hospital has treated since it opened in 2009 were citizens of former Soviet republics. A patient from Kaliningrad diagnosed with kidney cancer with multiple metastases was treated under the Da Vinci robotic surgical system. He now lives “a normal working life,” Trehan said.